Entry filed under: Business Strategy, Observations, Production Management, Uncategorized. Tags: cost control, efficiency management, expeience, fixed vs. variable cost, production, production capacity, textiles. 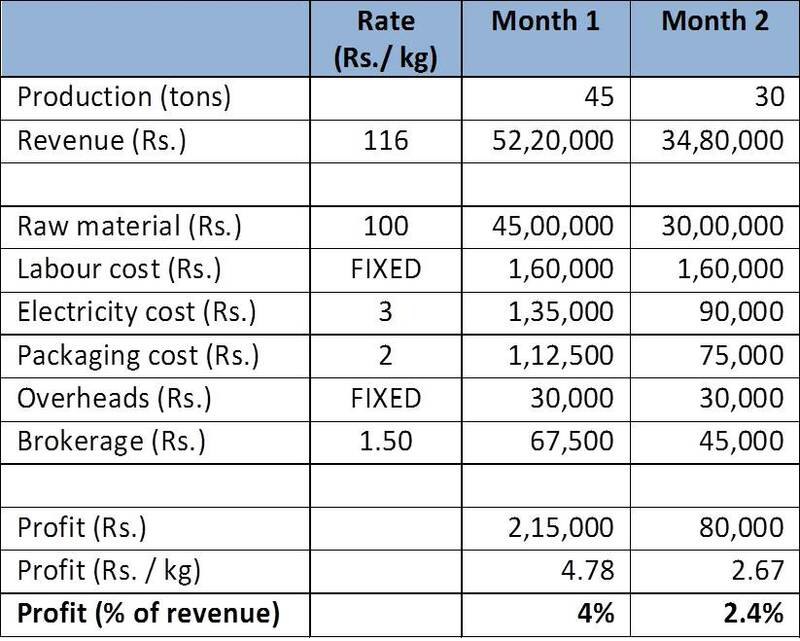 Just to draw an example from diamond manufacturing units – as I have in the previous comment – the ratio between fixed and variable costs has become key in increasing efficiency. Over the past few years we have succeeded in linking upto 70 to 80 percent of our manufacturing cost to production (which used to be 40 percent). It was a tedious exercise to negotiate with unions but even workers and supervisors saw the benefit by linking their salaries to their production. It was linking the salaries of supervisors which made the biggest difference because they in-turn looked at their department as owners would and began to take necessary steps to optimize production. We successfully made everyone feel responsible for production efficiency and become co-owners. The next step is to move from a linear unit linked incentive model to a more dynamic bell-curve model where workers would be compensated compared to the efficiency of other workers. The tricky part is to be able to effectively communicate this concept to the workers – because of which we have put it on hold. A big problem with efficiency in diamond polishing units, which you have also mentioned, is optimally building inventory with limited number of qualities. Raw material costs are high and prices are volatile which makes building inventories a tedious task. Often units purchase rough at losses just to sustain their production. It is a harsh truth about our industry mainly because of the oligopolistic nature of diamond miners. The only way a person can balance out effectively is to have a trading model which compliments their manufacturing. It would give units the flexibility to sit on excess trading inventories which they can route to manufacturing as and when required but still manage to profit from trading activities. Larger companies have managed to contractually bind miners to give constant supplies but it is a the smaller companies which really need the stability who have to suffer. Thanks for sharing so much of your actual experience, would love to know more about how you effected the change mentioned in the first paragraph of your comment. Glad you found the information useful. Do keep visiting our blog. Thanks Patty, and do continue to reading our blog. 1. Over time we had cultivated a relationship with workers and Union leaders based on trust. 2. We realized that a lot of workers had taken loans and needed job security as well as a chance to make more money. By linking their pay to production, they had the incentive to push harder so that they could reduce their debt. We listened to their needs and tried to work them into the agreement and made them responsible for how much they made. 3. In 2008 in spite of industry wide layoffs, we retained a lot of workers. They got a sense of security and were open to changing because they realized that the unit’s success depended on the work everyone put in collectively. 4. For the majority of workers their take-home was the same. A marginal percentage of workers were at a dis-advantage because their productivity was lower. However, this gave them a push to increase their productivity or quit (which opened up seats for more productive workers). Thanks for sharing the info. Am guessing the retention you mention in point 3 (during a time of industrywide layoffs) must have gone a long way towards firming up the atmosphere of trust. Thanks Crissy. Hope that helped. Do continue visiting our blog.